Snooker sensation Ding Junhui had single-handedly flown the China flag on the world stage over the past few years. However, Ding will not have to battle alone any more as Liang Wenbo marked his arrival as a world-class player with his runner-up finish at the Shanghai Masters on Sunday. It was a result which saw his world ranking rise to 13 - one place ahead of Ding. 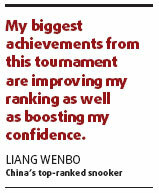 "My biggest achievements from this tournament are improving my ranking as well as boosting my confidence," said Liang. At 22, Liang became only the second Chinese player to reach a ranking tournament final and the fourth Asian man. He fell to world No 1 Ronnie O'Sullivan, 10-5, in the Shanghai final. The rising star won his first professional title, the Beijing International Challenge, against world No 2 Stephen Maguire, 7-6, last month. 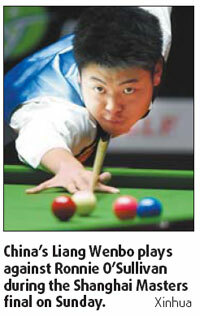 "This is a very good start for me and I hope I can achieve even more in the future," Liang said. Making it into the world top 16 means Liang automatically qualifies for the main draw of ranking tournaments. Liang made himself known to the world after an unexpected run into last year's World Championship quarterfinals as a qualifier. He took another giant step forward late last year by scoring 147 in a 5-1 victory over Martin Gould during qualifying for the Bahrain Championship. Modest Liang said he plans to focus on his game step by step rather than get caught up in the hype. "It's none of my business how they (fans and media) treat me," said Liang. "All I want to do is focus on how I play. My play is always changing but my life will remain the same." Some pundits have labeled Liang as China's No 1 now after Ding fell in the second round at Shanghai to O'Sullivan. Liang shrugged off the No 1 mantle. "What people say is not important. How I play is the real thing to me." Liang, the same age as Ding, refuses to be compared with his fellow countryman and claims they are good friends and fight for China. "Please do not make comparisons between us. We are very good friends and we play our best for China." Liang is set to fly to England for further training and competition. "I still have a long way to go to catch up with O'Sullivan. I have to work even harder," he said. O'Sullivan, who beat three Chinese players on his way to the title (he also had a first-round win over Marco Fu of Hong Kong), paid tribute to Liang after the final. "You think you've got him in trouble and then he pots a difficult ball and you have to stay in your seat you can get very frustrated," O'Sullivan said.